The Lutari Debate: Ally or Menace? Mysterious. Elusive. Wet. These three words all describe one new Neopet- the Lutari. The much-awaited Lutaris have brought a great deal of joy (and a great deal of Lutari-less users cursing slow computers) to the citizens of Neopia, and seem to be loved, adored, and revered everywhere. Recently, many… interesting… situations have developed around Neopia concerning the issue of Lutaris. Where do these Neopets come from? Why are they limited edition? Are they conspiring to take over Neopia? Questions have been asked, but no answers have been given from our slippery new friends. LUTARIS AND MEEPITS HAVE COMBINED FORCES TO TAKE OVER NEOPIA! LYK, RUN!!! Piece Of Obvious Proof (hereby shortened to POOP) #1: Argh, there is no template file! So, time to enter possible-scenario mode. You happen upon someone’s Lutari’s petpage and decide to check it out. Then you click on the blue-Lupe-head link, ready to see a bunch of prettiness that tells you all about Lutaris. Wait. What’s this? An error? That’s right, folks. At the time of writing, Lutaris do not have a generic petpage. Suspicious? YOU BET! Generic petpages typically serve the purpose of telling us about the Neopet they’re centered on. If the Lutaris have refused to let their petpages be shown, they’re probably hiding something… their history? Where they originally came from? Their currently unrealized tendency to be spontaneously thrown into fits of blind rage? Neopians have good reason to be cautious. Many Lutari-less owners have recently gone spasms of despair over the fact that only 5000 Lutaris have been allowed to enter Neopia. Of course, there are other Lutaris that have been created through the secret laboratory ray, but for the purpose of this argument, those Lutaris do not count. So, why have so few Lutaris arrived? Are they naturally small in population, or did something stop their numbers from coming? Did the Glorious Ones Who Release The Limited Edition Neopets decide that it would be fun to torture all of us innocent Neopians, OR did they realize after letting out the Lutaris that there was something wrong with that particular species of pet? Is it even possible that the Lutaris now in Neopia are merely the scout party of a much larger group who will soon come to take over Neopia? To those of us with wary minds, the latter may seem more likely. Those Neopians who are fortunate (or should it be unlucky?) enough to own a Lutari know that there is something very statistically strange about this type of Neopet- namely, the fact that they cannot be pounded. While pound-surfers may only emit sobs of tragedy over this fact, the rest of the population cannot help but feel confused. Why do Lutaris not like the pound? Are they simply smarter than other Neopets, or do they have a deeper, more malicious reason? Another interesting fact is that if a Lutari’s owner insists upon the pet being pounded, the Lutari does not actually go into the pound. Instead, they run away to some unknown place. SUSPICION ALERT! SUSPICION ALERT! What is this unknown place that they scamper off to? Their homeland? An evil base? However, Neopians can be reassured of one fact- it is most definitely not the so-called Lutari Island. Honestly, Lutari Island? Do we have proof that such a thing could exist? And besides, it makes no sense whatsoever that a Lutari would flee to a place called Lutari Island. There’s no connection between the two at all. This POOP requires some background research. Go to the Rainbow Pool. Find the picture of a yellow Lutari. Look at it. Now, observe its eyes. What color are they? WHAT DO YOU MEAN, YELLOW? Alright, alright, try again. Orange? No, orange isn’t right either. Puce? Sheesh, you people need to get your eyes checked. Fine then, I’ll give you the answer: Red. Yellow Lutaris have red eyes! Isn’t that suspicious? This POOP has been cut off for being exceedingly irrelevant. You may continue with your informative reading now. The day after Lutaris arrived in Neopia, a new Lenny Conundrum was put up. That in itself is not suspicious. HOWEVER, the conundrum was centered on some incredibly suspicious characters: Meepits. Meepits that were watching you. Having a bunch of Meepits stare at you all day long cannot be fun, but more important is knowing why. Why were the Meepits staring? Was it because they knew that the Lutaris had just arrived, and they wanted to see whether or not you had gotten one? Or perhaps it was just a coincidence. Though if you honestly think that it was just a fluke of nature, you need to get your brain checked for signs of Meepit hypnotism. Lutaris are not the only new species of Neopet. Xweetoks, Ogrins, and Gnorbu have also been released in the past six months. Why so many new Neopets, and so close together? Could they be PLOTTING something? Neopians should note that the three non-limited new Neopets spread across a variety of traits. Xweetoks are incredibly cute and adorable, and will catch the hearts of many owners who love all that is pink and fluffy. Gnorbu are intriguing and have interesting mane-type-things, and were even Neopian-picked from the April Fools contest (which makes them all the neater). Ogrins are rather, well, weird, but all those wackos out there in Neopia who like oddball pets have made sure to pick one up. 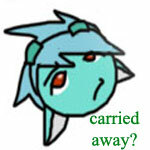 And then there are Lutaris, who are obviously cool and just plain want-able. Those four pets have all the Gormball spaces covered, don’t they? With all their different forms of being appealing, they’ve made it so that nearly every owner in Neopia has at least one of them. This could be called a coincidence- or they could have all come at once on purpose. And now, the truth! For it’s very true indeed- all three species are the minions of the Lutaris. They came to Neopia to see what our world was like, and to prepare us for the coming of their masters. All those who own one of those pets, beware! Make sure you know where their loyalties lie! And now, before the article closes, readers will find one extra POOP- an interview with an actual Lutari! After many rigorous hours of negotiating and bribing, silent_snow (the writer) managed to obtain an interview with OlimFabula, yellow Lutari. Silent_snow (S.S.): Is this recorder thing on? I knew I shouldn’t have trusted Sloth with- AH! IT’S BLINKING! What? That means it’s recording? Aww, shoot… ahem… Thanks for agreeing to give me an interview, Olim! OlimFabula (Olim): Wait, so now ‘agreeing’ is defined as blindfolding me and tying me to a chair? When you could have just asked, being my owner and all? SS: FIRST QUESTION! Are you or are you a member of an evil organization planning to destroy Neopia? Olim: You only gave me one choice, do you call that fair? SS: I’m asking the questions, cheese-eater! SS: SECOND QUESTION! Have you ever been in contact with a Meepit or multiple Meepits? Olim: Oh, wait. There was that one time when they came by and were chewing on the front door. I think they wanted to ‘meep’ at you. How do they know you, anyway? SS: Er… THIRD QUESTION! Have you ever been to a ‘Lutari Island’? Olim: I don’t think so, though I believe I read something about it in an editorial once. SS: No, you didn’t! It doesn’t exist! SS: FOURTH QUESTION! What color are your eyes? Olim: Yellow, though they look kind of orange. There you have it readers- clear proof! Obviously, the Lutaris are up to something. And for all those fools who still do not believe, you should realize one thing - a long, long, long time ago, when Ixis were first released, they were limited edition. Shortly after, the land of Meridell was found. Everyone knows that Meridell is the homeland of dung. Yes, the horrible dung which has invaded Neopia was heralded by the arrival of Ixis! Is a similar catastrophe soon to occur with the Lutaris? Until next time, Neopians… BEWARE! Author’s note: Please do not take anything written in this article seriously. I am as much of a Lutari fan as the rest of you Neopians… though one has to admit that they are a mysterious lot. Who's really at fault here?